The cat was sitting in the window. I saw it from a distance on the road and what attracted it to me is the red and white polka dot pattern of the curtains. I saw something in the left hand corner but couldn't make out what it was. The owner of the property came out and gave me permission to get up close and personal. I converted the color image to black and white using grey scale and then went to brightness - saturation and played with contrast until I liked what I saw. I use Photoshop Elements 4. This is a terrific photo to add the black and white treatment to, and well done to Mort to have the courage to go and ask the owner if it was ok to get a shot. 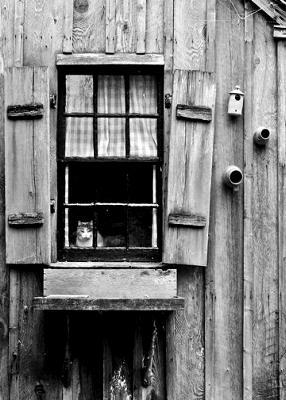 The old wood in this photo, and the old window really do make this excellent black and white subject matter. Add in the cat and it really makes this picture something special! Thanks Mort for the submission!